I was in the States for the MW show I got to meet someone from _within_ Yes' management backstage who was present for some of the conferences when it was being decided what to play. Yes were *advised* that the fanbase would not tolerate the band playing the same material they had been playing for the past few tours. It really was time to play a different kind of set. I believe that this prompted the band to ask Yesworld to conduct the survey, and I also believe that Yes ,being Yes, they can not refrain from putting a spin on it. In a recent interview in the Baltimore SUN with Bela Fleck, Fleck talked about Jon Anderson's guest appearance on his new album. He said that Yes called him about being the opening act on this summer's tour. He declined, but offered Jon a spot on the cd as a gesture of good will. Jon accepted immediately, Fleck flew out to LA with several tracks he was working on, and Jon added vocals to two of them. Mind Drive was dropped apparently early on as some members of the band wasn't as excited about playing it (Igor by his own admission) and felt they needed to concentrate on getting the really important numbers right (CTTE, Gates and Ritual). It's a sad day for Yes fans in Australia and New Zealand. Apparently, the Australian leg of Yes's world tour this year has been scrapped...I'm not certain of the exact reasons, but I do know it's off. Howe is still interested in doing a solo tour of Australia in the near future, but that is probably as close as we'll ever get to seeing Yes in our part of the world again. So, as I do not have the cash to travel to the USA to see Yes (well, certainly not this year, that's for sure) I am now going to drown my sorrows with a few stiff Glenfiddichs. I'll regret doing this tomorrow morning, of course, but it seems an appropriate course of action right now. "Close to the Edge" (opener), "South Side of the Sky", "Ritual", "Gates of Delirium", "Mind Drive", "Homeworld" + an encore of some shorter songs. The choice of songs was heavily influenced by the YesWorld poll results. However, Howe is reportedly pessimistic as to whether they can actually pull this all off. What can one say but... wow! "Yes - The Masterworks tour will feature what a press release is calling the English band's "epic masterpieces" - in other words, all the really long songs that were the soundtrack to all those bong hits you did in the 70's. Kansas opens. No, we don't know why either". I think the writer nailed it. I was at work today and had 105.5 (WDHA) on and at about 2.00 they were playing a double play of Yes and when the songs were over the DJ had Jon on the air (he was calling from So. California). She was asking about the upcoming tour and Jon said they will play for a little over 2 hours, he said they will play 5 epic songs (he did say "Gates"),and then 2 or 3 songs and then an encore, but he did not mention anything about Billy. My sources (close to the band) tell me that they're still experimenting with different pieces, and are considering doing a medley - similar to the one they did on tour in 1978. Here's the latest setlist information that I managed to get my grubby little hands on! They will be playing Revealing Science of God, Mind Drive, and Awaken. I don't know if this means Ritual is out or if they'll be doing two Tales songs. The following all seem to have a good chance of being in the [Masterworks] set list: "Gates", "Ritual", "CttEdge", "& You & I", "HotSunrise", "Roundabout", "Awaken". Just maybe, we'll also get: "Mind Drive", "Sweet Dreams", "Silent Wings". Roundabout, Close to the Edge, Ritual - Nous Sommes Du Soleil, and You & I, Heart Of The Sunrise and Awaken. Now I know last tour they listed some songs that weren't played, but I think they were just hits. I would think that the inclusion of Ritual may have been from input of band. This lends more credence to what Steven has posted. But we know how things change in the Yes camp. If it is included in set list, for how long? Maybe I'll look into seeing how much tickets to Reno are. Btw a columnist in newspaper has Kansas as opening (not sharing) the show and the advert has: with special guest Kansas. The newest (Ladder) logo is the main picture used. 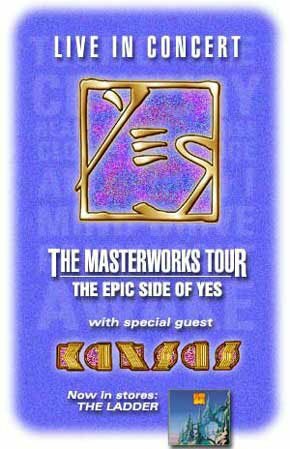 Yes is coming to the States this summer to present a concert experience featuring the band's epic songs. The 32-year-old band is known for combining art and multimedia with its music on tour. Yes representatives have promised the 30-date Masterworks tour will feature a fan-driven set of the complex arrangements that have positioned this band as a perennial favorite with prog-rock fans. "This has been a long time coming," said lead singer Jon Anderson. "Our audience has been asking for this for years. We want this show to honor their passion and loyalty." Yes and special guest Kansas will kick off the tour in Reno, Nev. on June 20 and end it August 1 in West Palm Beach, Fla., Tickets for all shows will go on sale in early May. I heard news that Yes went into the studio this month (April) to record with an orchestra. They wanted to bring the orchestra with them to America for like 12 dates in major U.S. cities. The only thing was that they wanted the record label to pay each orchestra member's salary. The label basically said, "Get the hell out of here!"